Put a cup of crushed ice into a blender. 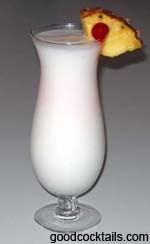 Pour piña colada mix until the top of the ice. Add a splash of pineapple juice and blend. You may use a Collins glass for this drink.